Last Summer, Gary Freeman brought home the hardware. An athlete with Special Olympics Aurora, Mr. Freeman represented Team Ontario at the Nationals in Nova Scotia and found a comfortable place at the podium, bringing two of three medals home to Aurora. His achievements, along with those of Special Olympics Coach Deb Finniear were recognized with special certificates at Council last week to kick off Special Olympics Month in Aurora. April is here and, thanks to the yearly proclamation from Town Hall, it is a chance for all of Aurora to celebrate these hometown heroes. 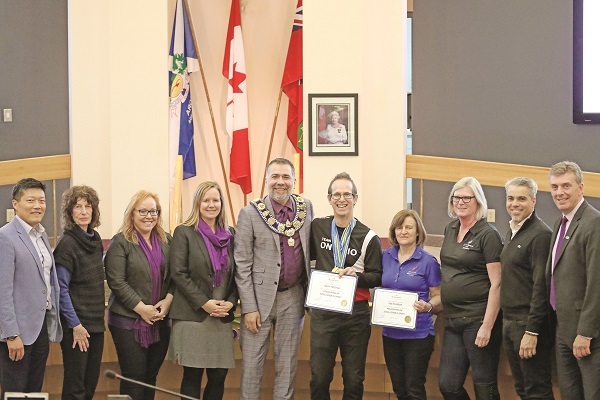 The first Special Olympics Month in Aurora was proclaimed last year by Mayor Geoff Dawe to mark the tenth anniversary of Special Olympics Aurora, and it is a tradition carried on this year by Mayor Tom Mrakas. A lot has transpired in the intervening months, according to Theresa Buck of Special Olympics Aurora, and the local club has celebrated many milestones that have seen them move the goalposts even further for the organization. From its beginnings in 1965, Special Olympics has grown to serve over two million athletes with intellectual disabilities in more than 150 countries. The Special Olympics has been a formal part of Aurora’s sporting life since 2008 with the formation of the Aurora Special Ducks swim club, which was founded in conjunction with the Aurora Ducks. “Since this inauguration of sport, we have continued to grow and currently offer seven sports that include nine sports programs that run year-round. These sports include swimming, basketball, bocce, golf, softball, rhythmic gymnastics and soccer,” Ms. Buck told Council last week. “We have 110 athletes and 95 volunteers. Athletes can age in range from 8 to 90, however there are two programs offered by the Town of Aurora. The first is Active Start, a program for children aged two to six, and Fundamentals for children aged seven to twelve that assist in preparing children at this young age for participation in Special Olympics Aurora sports-specific programs. “Our 2018 year was a very rewarding year for Special Olympics Aurora. In April, we celebrated our tenth anniversary and the 50th anniversary of Special Olympics. In recognition of both achievements, we arranged a flag raising ceremony and declaration by the Town Crier at Town Hall who announced April as Special Olympics Month. The actual written declaration and flag are available for viewing in our trophy case at the Aurora Family Leisure Complex and we will be requesting from the Town that April again be the official Special Olympics Month here in Aurora. In addition to their programs on the fields and on the courts, Special Olympics Aurora also offers a public speaking program which, Ms. Buck said, has since morphed into the Athlete Leadership Program. Looking ahead for the rest of 2019, Ms. Buck says the club will see athletes participate in the Provincial Qualifiers in basketball, swimming and rhythmic gymnastics. In addition, with the help of a recently added volunteer, they will put renewed focus on a Healthy Lifestyles program to work in conjunction with their sports offerings.